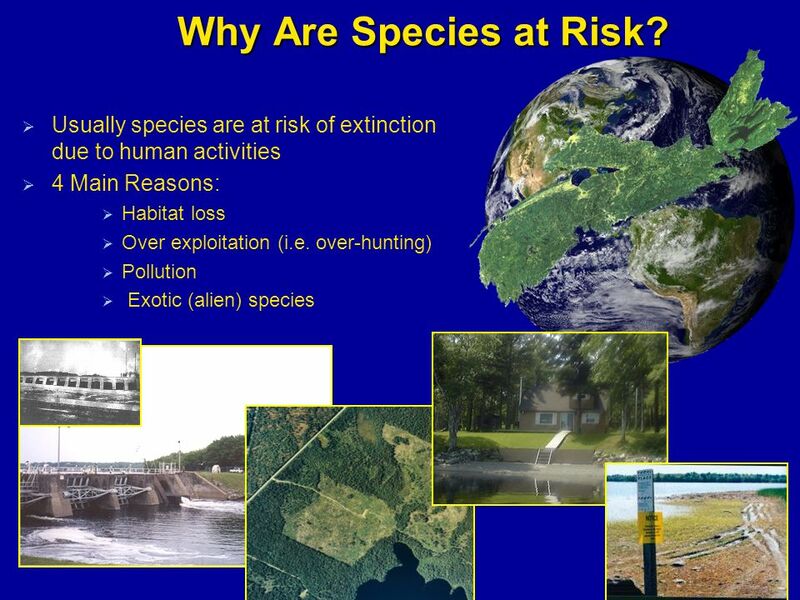 2 What are Species at Risk? 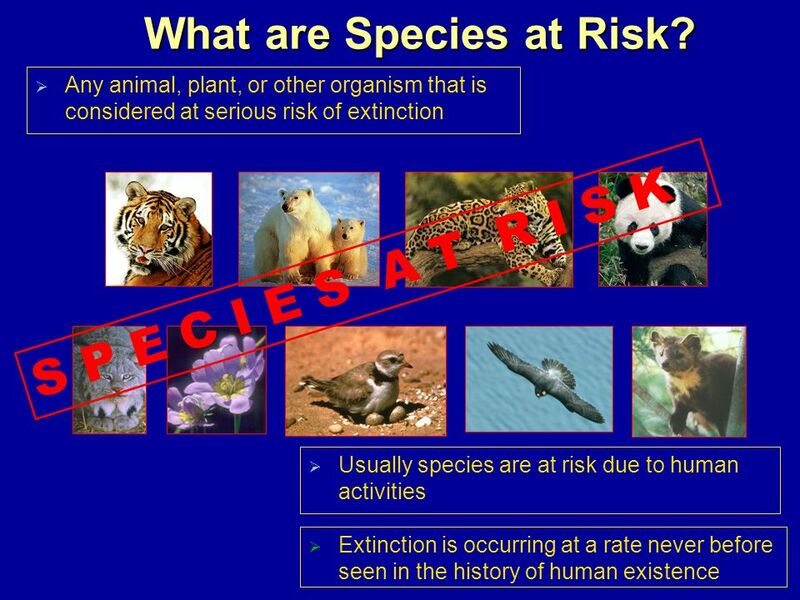 5 How many Species at Risk ? 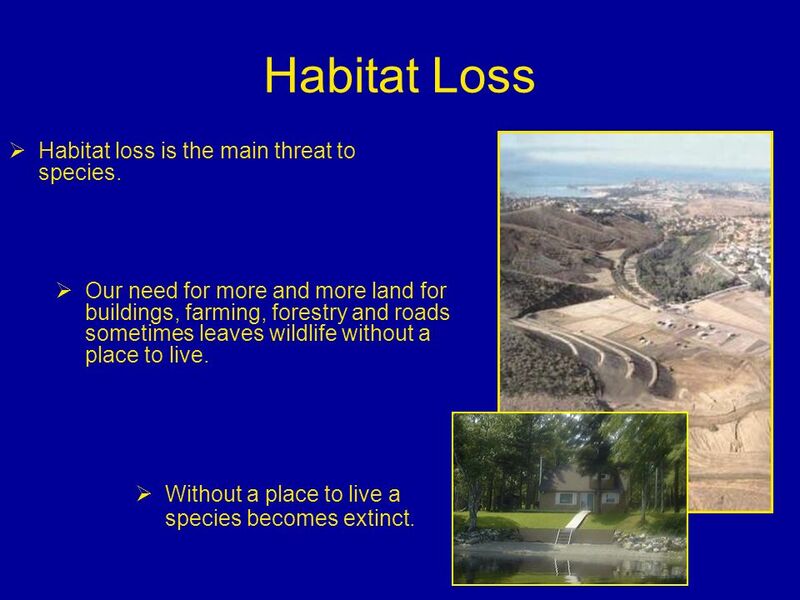 8 Habitat Loss Habitat loss is the main threat to species. Our need for more and more land for buildings, farming, forestry and roads sometimes leaves wildlife without a place to live. 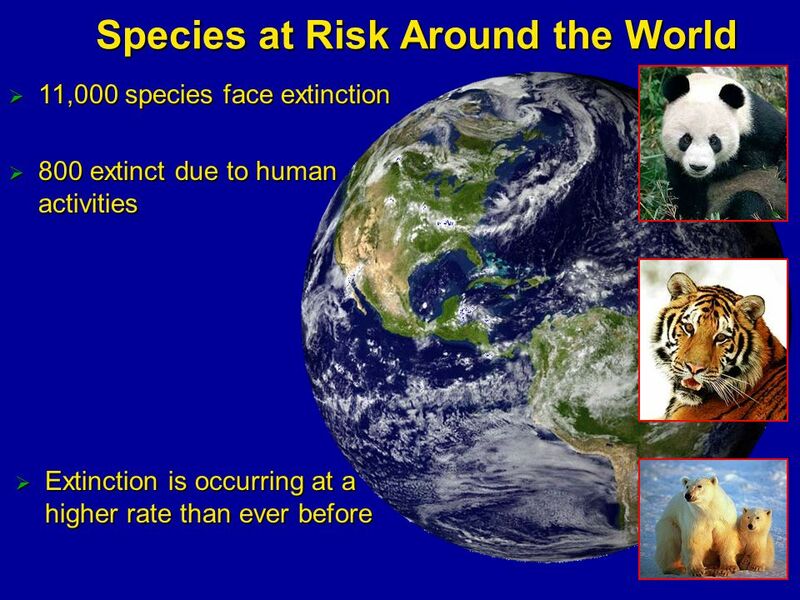 Without a place to live a species becomes extinct. 9 Over-Exploitation Another major cause of extinction is too much hunting, fishing, or trapping, called over-harvesting. 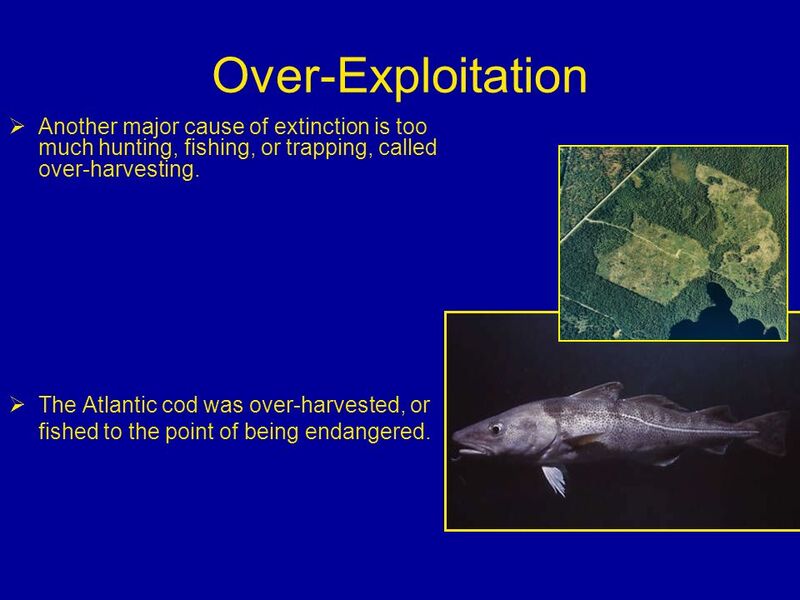 The Atlantic cod was over-harvested, or fished to the point of being endangered. 10 Alien Species Alien species are plants or animals that are introduced to an area by humans, either accidentally or on purpose. 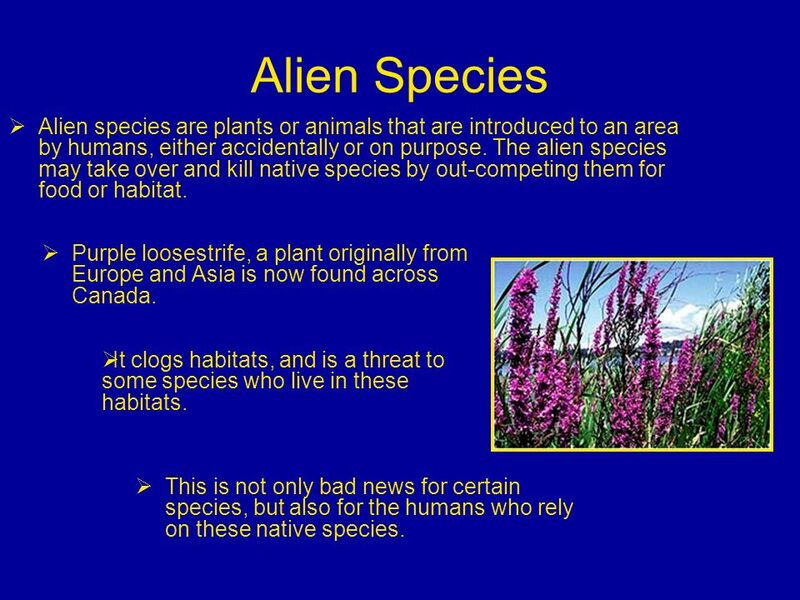 The alien species may take over and kill native species by out-competing them for food or habitat. Purple loosestrife, a plant originally from Europe and Asia is now found across Canada. It clogs habitats, and is a threat to some species who live in these habitats. This is not only bad news for certain species, but also for the humans who rely on these native species. 11 Pollution Toxic chemicals are finding their way into more and more water habitats. 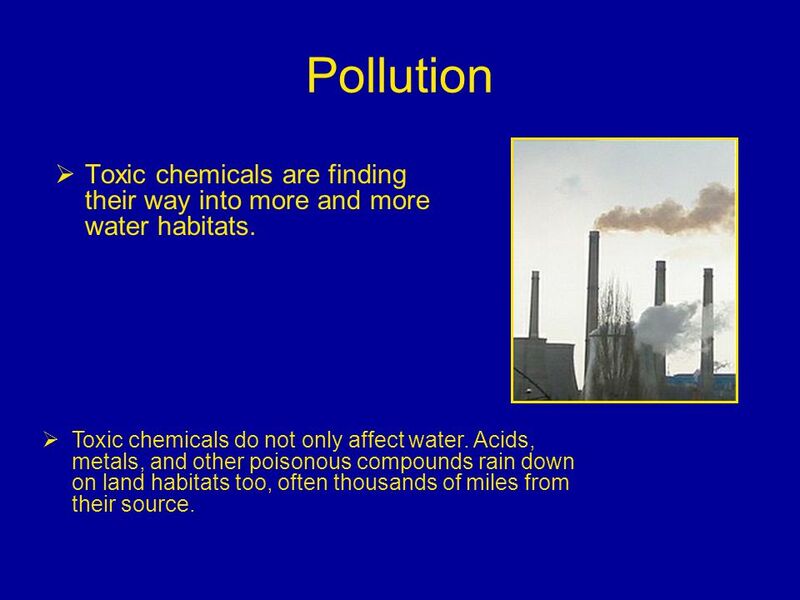 Toxic chemicals do not only affect water. Acids, metals, and other poisonous compounds rain down on land habitats too, often thousands of miles from their source. 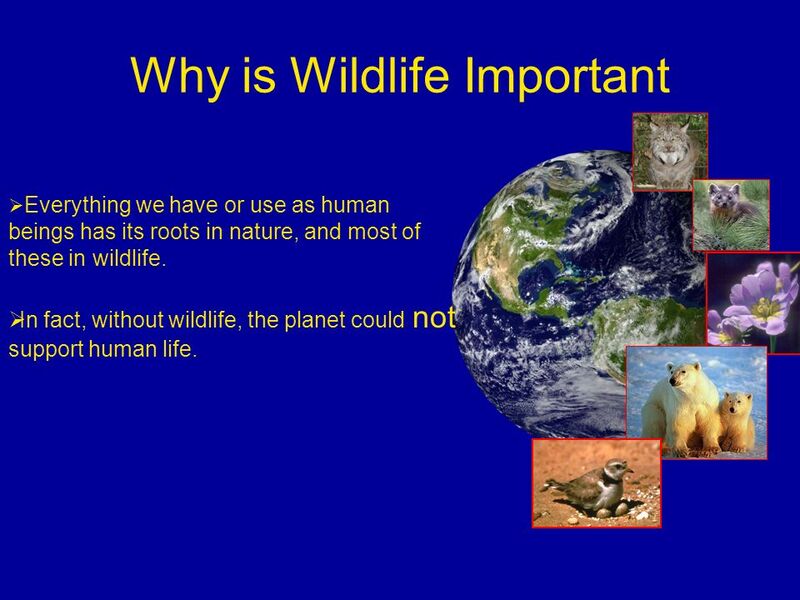 Everything we have or use as human beings has its roots in nature, and most of these in wildlife. In fact, without wildlife, the planet could not support human life. 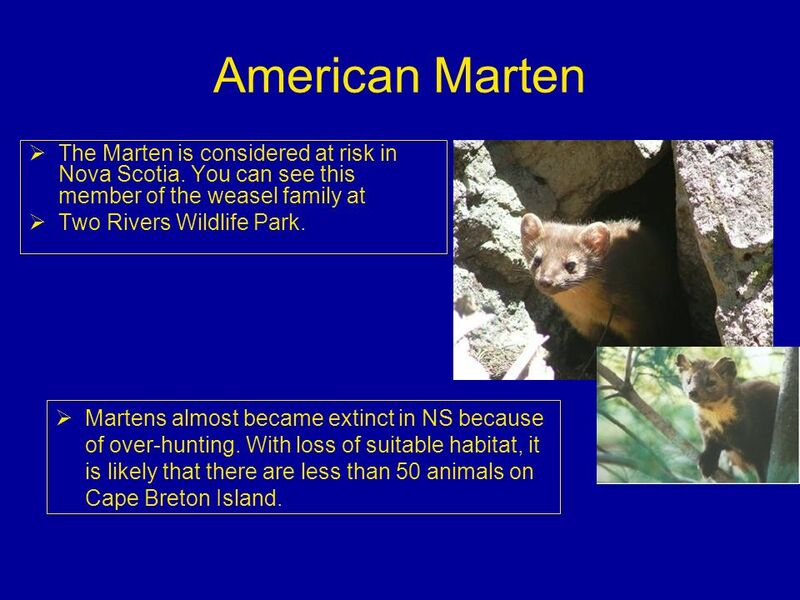 15 American Marten The Marten is considered at risk in Nova Scotia. You can see this member of the weasel family at Two Rivers Wildlife Park. 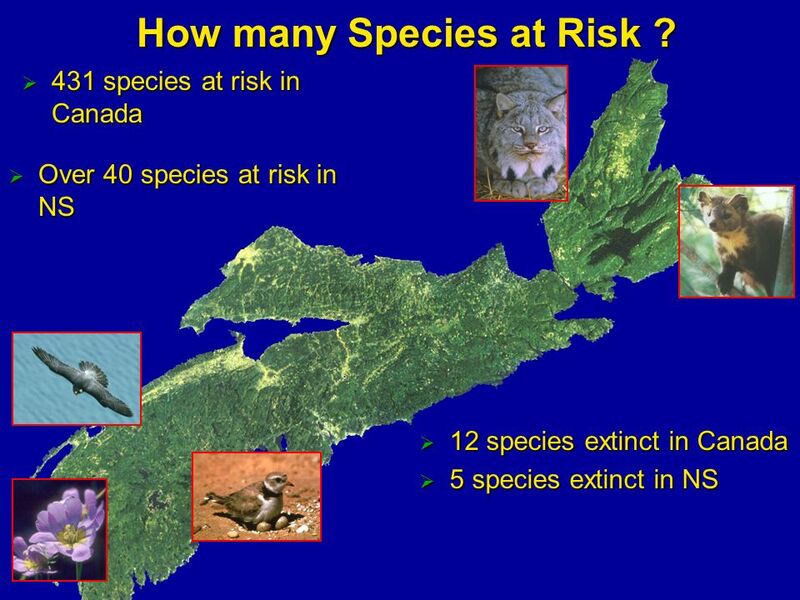 Martens almost became extinct in NS because of over-hunting. 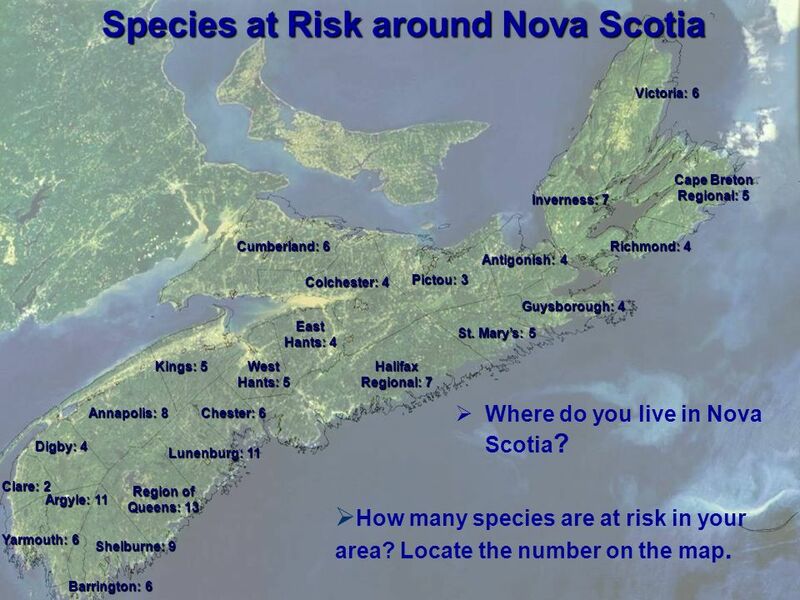 With loss of suitable habitat, it is likely that there are less than 50 animals on Cape Breton Island. 16 Moose The moose is the largest member of the deer family. Found throughout NS, moose are only considered at risk on the mainland. There is a healthy population on Cape Breton Island. 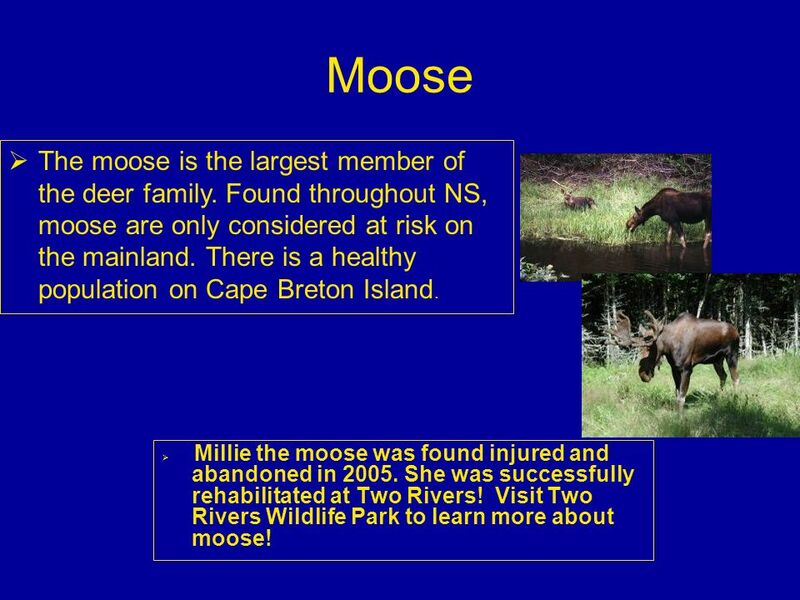 Millie the moose was found injured and abandoned in She was successfully rehabilitated at Two Rivers! Visit Two Rivers Wildlife Park to learn more about moose! 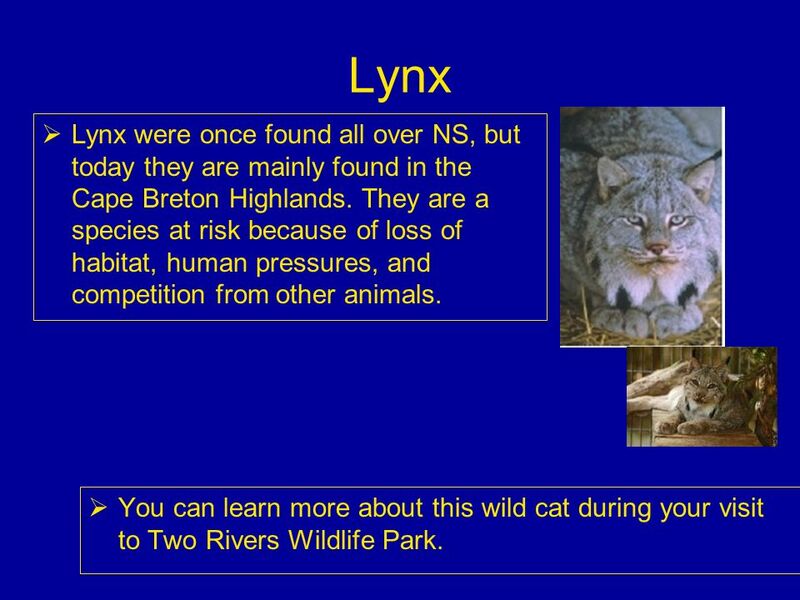 17 Lynx Lynx were once found all over NS, but today they are mainly found in the Cape Breton Highlands. They are a species at risk because of loss of habitat, human pressures, and competition from other animals. You can learn more about this wild cat during your visit to Two Rivers Wildlife Park. 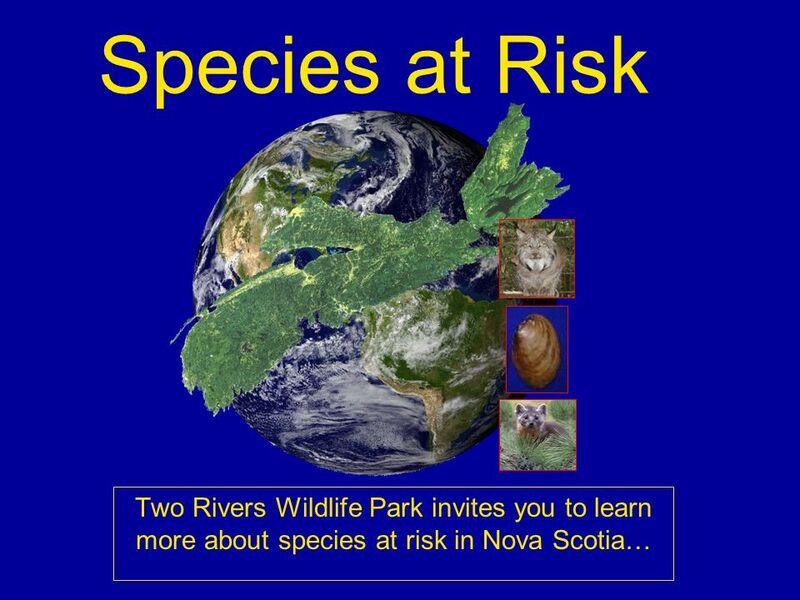 We hope you enjoyed this presentation about Species at Risk. 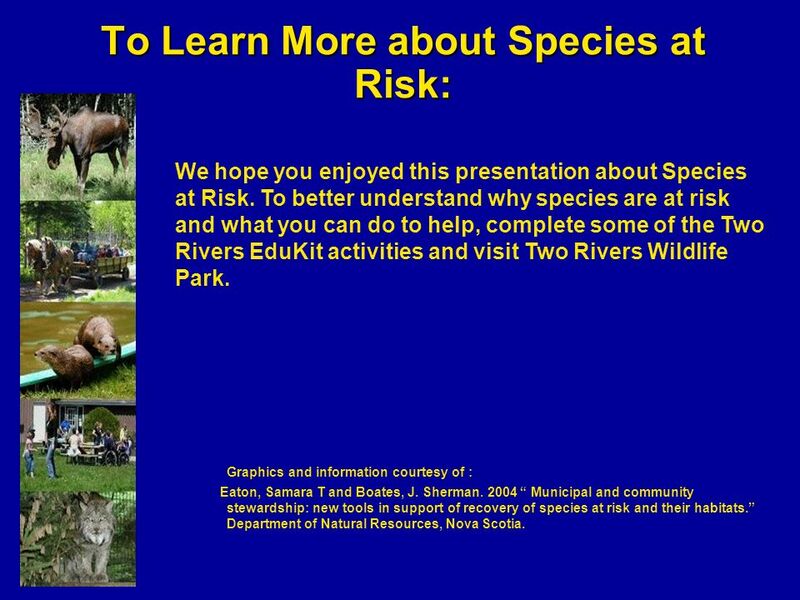 To better understand why species are at risk and what you can do to help, complete some of the Two Rivers EduKit activities and visit Two Rivers Wildlife Park. 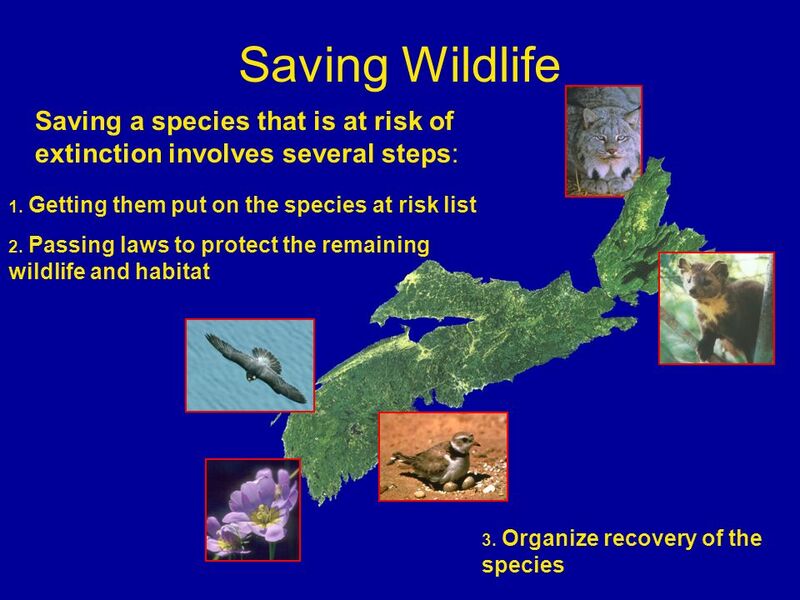 Graphics and information courtesy of : Eaton, Samara T and Boates, J. Sherman “ Municipal and community stewardship: new tools in support of recovery of species at risk and their habitats.” Department of Natural Resources, Nova Scotia. 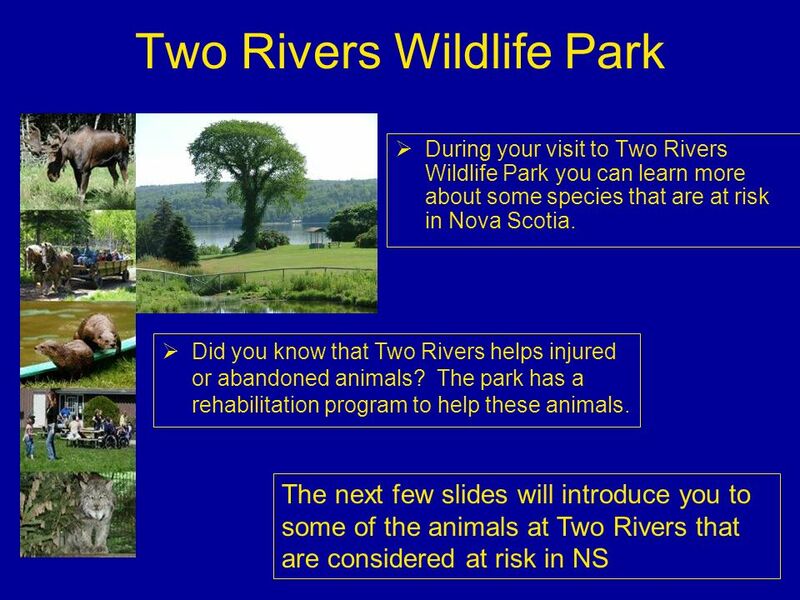 Download ppt "Species at Risk Two Rivers Wildlife Park invites you to learn more about species at risk in Nova Scotia…"
Endangered species. Endangered species is a population of organism which is at a risk of becoming extinct due to few in number, threatened by changing. Endangered Means There’s Still Time Endangered species are like fire alarms. They tell us about problems in our home we call Earth. If we listen to their. Global Biodiversity What is Biodiversity? We’ll get to that, but first.... Let’s take a step back in time. 10. 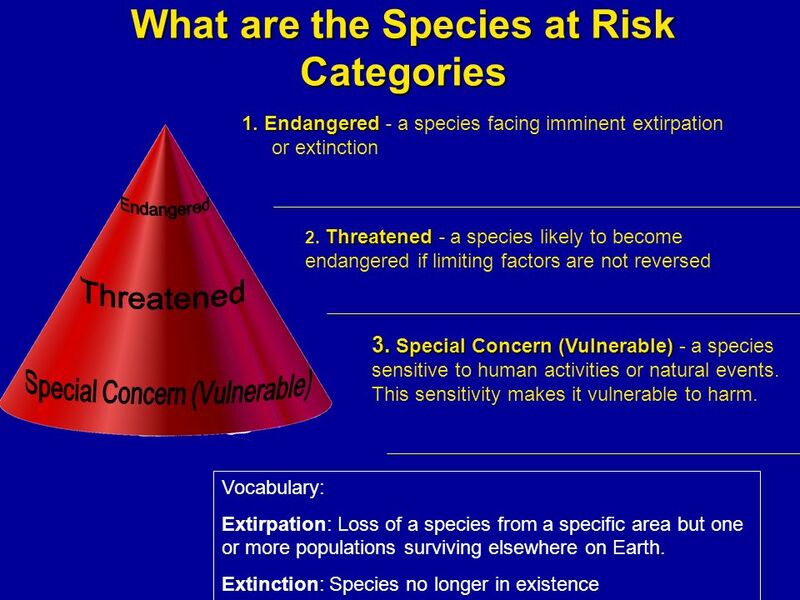 2 Objectives Define and give examples of endangered and threatened species. Describe several ways that species are being threatened with extinction. Endangered Species Endangered Speices Definitions Vulnerable Species: A species that is not yet threatened, but one whose population is quickly declining. Form groups of three students. –In your own words define the following terms: –1.Bio –2.Diversity –3.Endangered. “The first animal species to go are the big, the slow, the tasty, and those with valuable parts such as tusks and skins.” E.O. Wilson. 3.2 Summary: How Human influence Ecosystems  Sustainability: is the ability of an ecosystem to sustain itself or the ability of an ecosystem to continue. Species at Risk.  Plant and animal that has a low or declining population  May be at risk of extinction  Species that is sensitive to human disturbance.